The Logeion app. The University of Chicago, 2013. iTunes. Free. The Logeion mobile application aims to provide a one-stop look up for Greek and Latin dictionary entries. Like its parent website, also developed at the University of Chicago, it collects and presents a wide range of valuable reference materials. Basiswoordenlijst Latijn (BWL), a Latin dictionary that include examples of Latin words in context, illustrating their most common uses. LaNe, the Latin-Dutch dictionary accessible from the Logeion website, is not currently available from the mobile application. 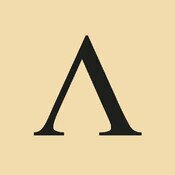 DuCange, the reference work for medieval and late Latin, while available on the mobile application, is not provided in its full-text version as on the Logeion website. Even so the Logeion app is an unparalleled resource for students of Greek and Latin, and serves a wide range of specializations within Classics. The ease and simplicity of its interface ensures that despite the daunting amount of material even beginning students of Classics will benefit. And crucially the mobile platform allows users to access all these fantastic resources without an internet connection. I tested this application on both an iPhone 4 (running iOS 7.0.4) and an iPad. The most important distinction between the two is that the iPhone application allows only for portrait view, while the iPad allows for both portrait and landscape. The landscape view is more attractive and efficient than the portrait view, as it allows the menu to be visible alongside the content. The iPhone also does not allow for the word wheel. In what follows I will discuss the application as experienced from the landscape view on an iPad. 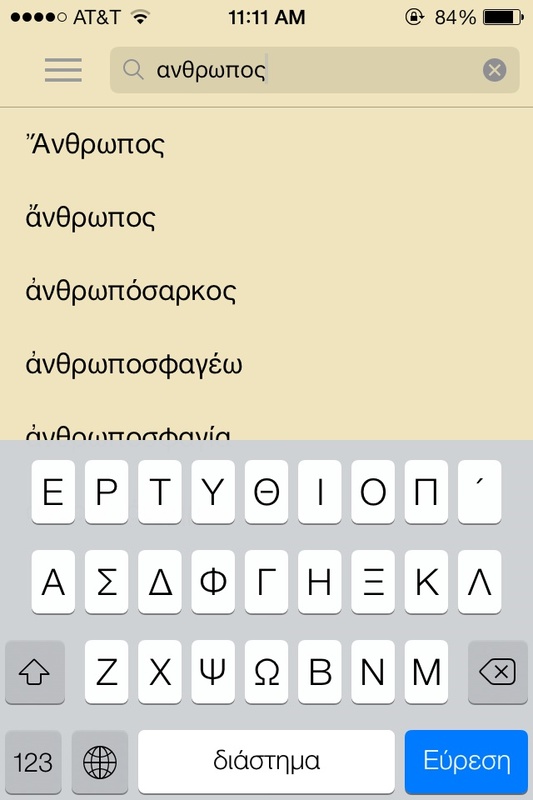 The Greek keyboard is easily enabled. The Greek keyboard is easily enabled.On opening, the program defaults to an entry for the Latin word lux. At the top left is the search field. From here the user may type in words in Latin or Greek, using the Modern Greek keyboard, which must be enabled. Transliteration is not supported (as it is on the website), but enabling the Greek keyboard is easy, and the application has a help section with detailed instructions for doing so. Greek words may be typed in without accents, which would be difficult and tedious to type, especially on a mobile device. 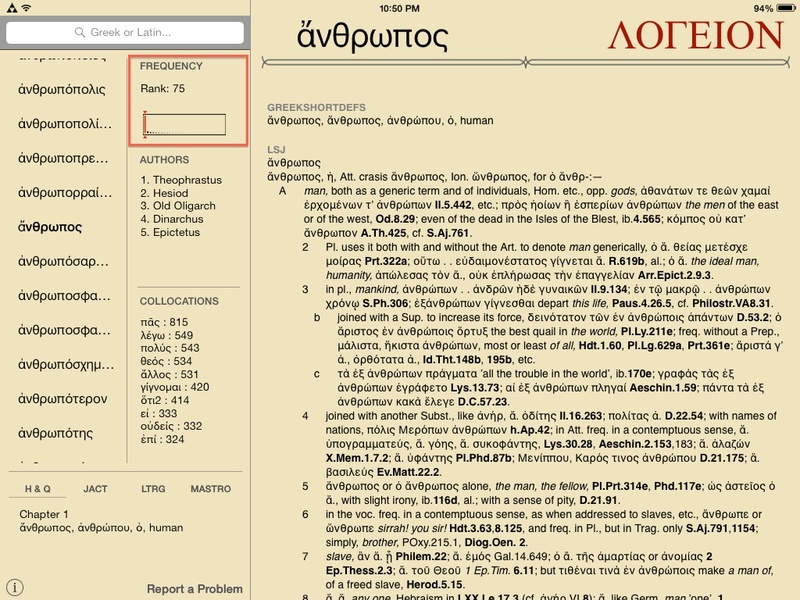 The word ἄνθρωπος had to be typed in fully, but other words are more quickly recognized by the application, which begins to provide results from the third letter. Something that was at first confusing was that ἄνθρωπος was given twice, the first capitalized and the second not. Reading the help section explained this: proper nouns are included alongside nouns and verbs in the search results. Even so, it would be helpful if from these search results one could view some information about each result. As it is, clicking on any result immediately takes one to the full entry entry, and to get back to the previous results it is necessary to fully retype the search . Once on the noun ἄνθρωπος, the menu on the left gives a scrollable word wheel of words alphabetically before and after ἄνθρωπος. The word wheel is not continuous and infinite, however, and to navigate to more than twenty words away you can scroll up the twentieth word and select that as the new entry, thus generating a new word wheel range. It would have been nice I think to have a full word wheel from which I could have scrolled as far as I needed. This may be more pertinent in cases where the search is for a very commonly used stem or verb from which derive many entries, such as νομίζω. Being able to continuously scroll through all the entries would be helpful in these cases. Alongside the word wheel is further information about the entry. At the top is the frequency, ranked along a scale that groups words by their frequency across all texts, in increments of 150 words. A number is given as well as a red line, making it instantly and very clear how often the word is used. Below that is a list of authors in whose works this word appears. This is given in addition to the examples from the corpus which are included at the bottom of word entries, when available. Below the list of authors is a list of collocations. This is a valuable piece of information to have apart from the dictionary entries. Collocations are often given within the dense block of text for each word entry, and having them separate allows for quick reference. 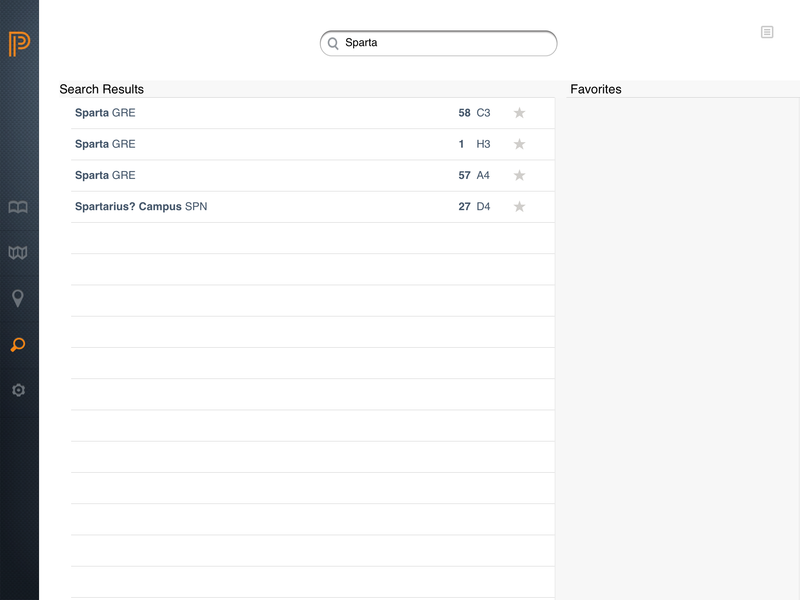 The user can easily navigate between textbooks simply by clicking on them, which will provide the entry in the textbook, as well as where it can be found. In the bottom left corner is an information link that provides tips on how to use the application and explanation of its various functions. Within the actual word entry, the first information given is always the “ShortDef,” which provides the most basic definition(s) of the headword. Following that is the entry for that word in all the available reference materials. At the end of the dictionary entries, examples from the corpus in which this word is used is also provided. For anyone who has ever had to work with multiple dictionaries and texts open at the same time, being able to simply scroll and access so much information with the simple swipe of a finger from a single device is truly appreciated. I have no doubt that the application will continue to be added to, both in regards to content as well as usability. Elements of the application that I would wish to be added is a way to bookmark certain entries, or perhaps create a favorites section for choice words. As it stands now, however, the Logeion mobile application represents a crowning achievement for the digital classics, and a tool that I envision having great use for students and educators alike. This entry was posted in DH Direct, Uncategorized and tagged Logeion, Plekhov on January 28, 2014 by Chris Francese. College Archivist James Gerencser passes on this note on the progress and reception of Carlisle Indian Industrial School digital humanities project. The CIIS project received some attention recently, and comments and questions from new visitors to the project’s website have been rolling in ever since. The interest was sparked by a short article in the online publication “Indian Country Today.” Rick Kearns, author of the piece, spoke with the project’s three co-directors back in December 2013, and he felt that a wide audience would be excited to learn about this new online resource. The article was posted on January 10, alerting an interested user community to our activities just as a team of interns arrived in Washington, DC to scan more documents (roughly 16,700 of them) at the U.S. National Archives. As links to the article were shared by colleagues across the country via Facebook, Twitter, and Google+, we were pleased to see the high level of interest and enthusiasm for the project. In just the first week after the article appeared, the site registered 1655 visitors, while it had recorded only 337 visitors over the previous month. Even more exciting than the general buzz, however, was this blog post by Larry Cebula, Associate Professor of History at Eastern Washington University. Dr. Cebula took some time to explore our website and discovered Lulu O’Hara, a student from Washington who was a member of the Spokane Tribe. In his post, Dr. Cebula used Lulu to demonstrate, in a very simple and straightforward way, how a researcher could examine the contents of a student’s digitized file and piece together a story of her time at the school. He then went a bit further by connecting Lulu to other materials available online, including a photograph on Flickr featuring Lulu’s school class from before she attended Carlisle, and a portion of an oral history included in a National Park Service educator’s guide. Dr. Cebula’s post provides a great example of the potential for the project, demonstrating to users how a little additional searching can help turn a few interesting items into a larger story. 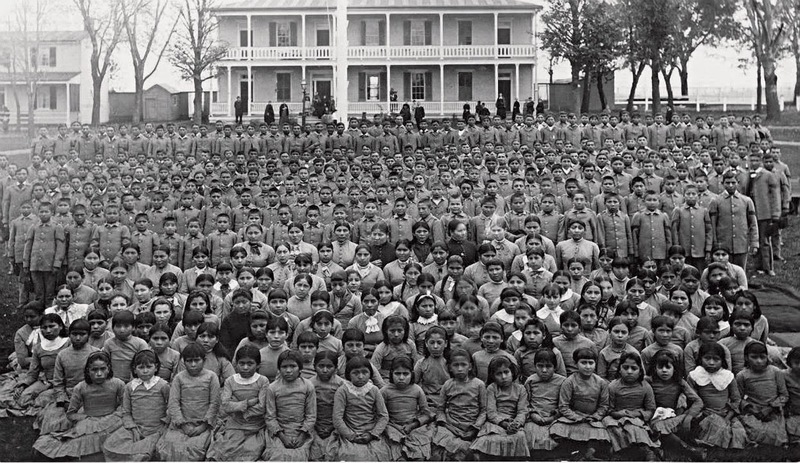 For as much information as we plan to make readily available via the Carlisle Indian School website, we do not want people ever to assume that this is all there is to the story of the school, or to the stories of the 10,000 students who attended the school. Too often students and other researchers fail to take the next important steps to build upon what fragments of documentation they uncover, but Dr. Cebula shows how valuable and rich the stories can become with some additional effort. In the coming years, we look forward to assisting a broad public in bringing these stories to light. This entry was posted in projects, Uncategorized and tagged CIIS, Gerencser on January 28, 2014 by Chris Francese. 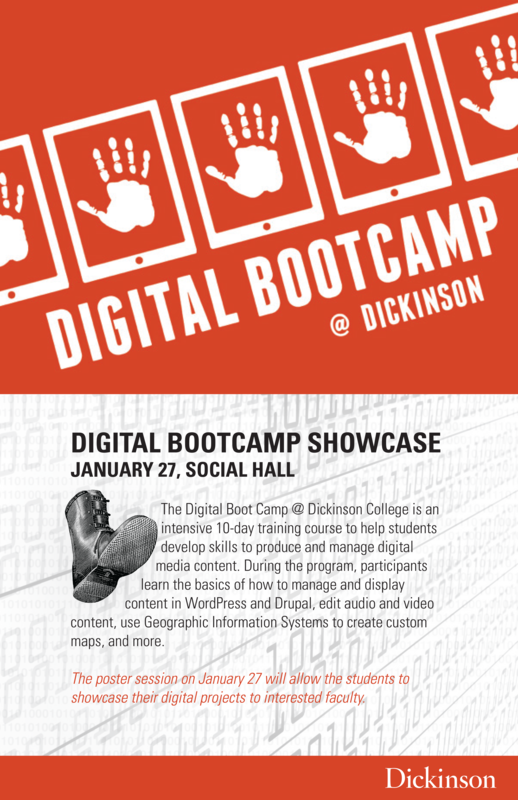 The Digital Boot Camp @ Dickinson College is an intensive 10-day training course to help students develop skills to produce and manage digital media content. During the program, participants learn about the basics of how to manage and display content in WordPress and Drupal, edit audio and video content, use Geographic Information Systems to create custom maps, and more. 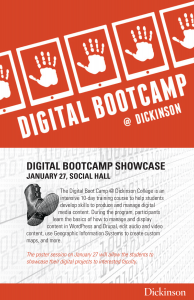 The poster session on January 27 will allow students to showcase their digital projects to interested faculty. Please stop by next Monday anytime between 12:00-1:30pm in one of the Social Hall sections in the Holland Union Building to see what the participants have digitally created. Food and beverages will be provided. This entry was posted in Uncategorized on January 22, 2014 by kochism. The Fulbright – National Geographic Digital Storytelling Fellowship is a new component of the Fulbright U.S. Student Program that provides opportunities for U.S. citizens to participate in an academic year of overseas travel and digital storytelling in up to three countries on a globally significant social or environmental topic. This Fellowship is made possible through a partnership between the U.S. Department of State and the National Geographic Society. Through the Fulbright – National Geographic Digital Storytelling Fellowship, Fulbrighters will undertake an in-depth examination of a globally relevant issue, comparing and contrasting how that issue is experienced across borders. Utilizing a variety of digital storytelling tools, including text, photography, video, audio, graphic illustrations, and/or social media, Fellows will tell their stories, or the stories of those they meet, publishing their work on National Geographic media platforms with the support of National Geographic’s editorial team. For the Fellowship’s inaugural year of 2014, applications will be accepted for the following themes: Biodiversity, Cities, Climate Change, Cultures, Energy, Food, Oceans, and Water. This entry was posted in Uncategorized on January 18, 2014 by Chris Francese. 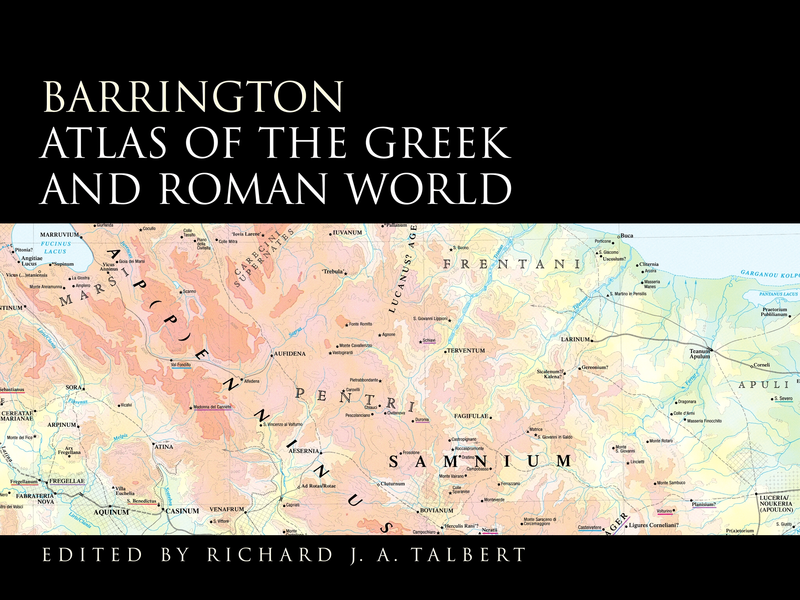 Barrington Atlas of the Greek and Roman World App. Princeton University Press, 2013. iTunes $19.95 US. In December 2013 Princeton University Press launched the much anticipated app version of its Barrington Atlas of the Greek and Roman World. The original print version of the Atlas, overseen by Richard J. 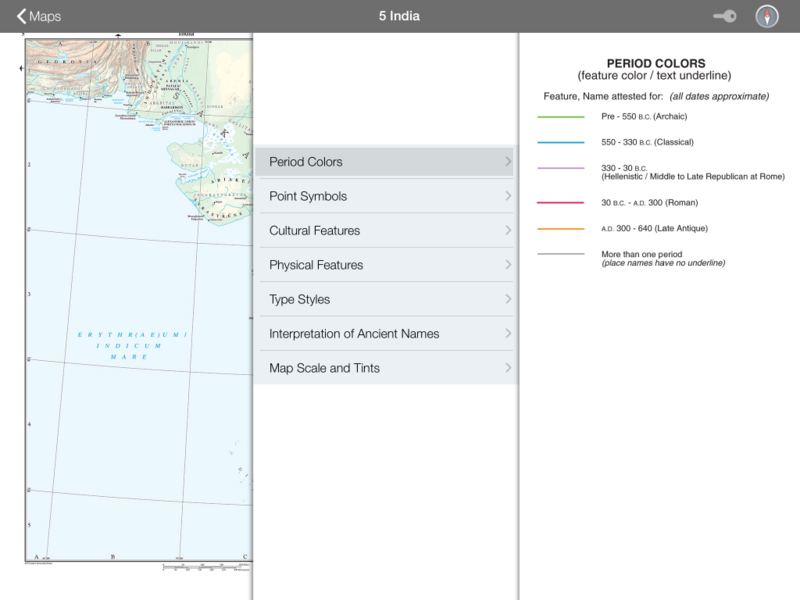 A. Talbert and published in 2000, was the first atlas to provide comprehensive maps of ancient Greek and Roman territories stretching from Britain to India and Africa. 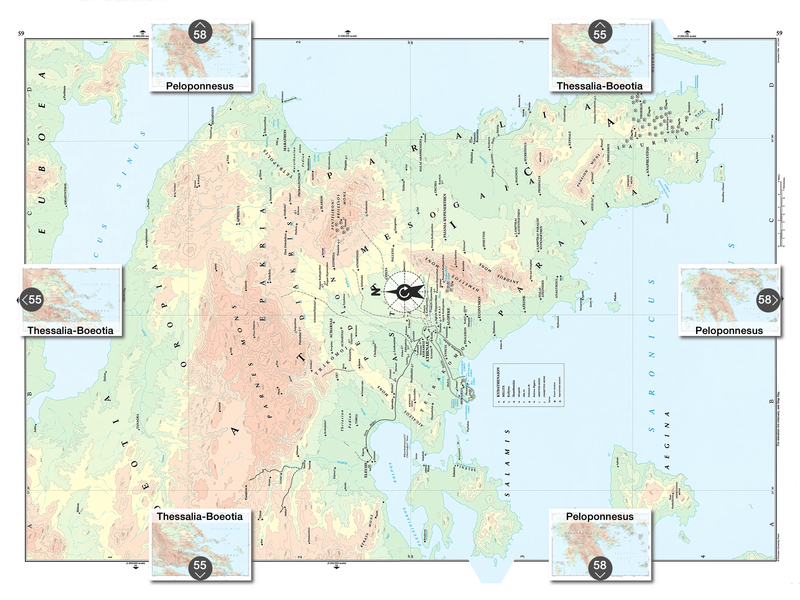 It immediately became the standard for maps of that part of the ancient world. The extent of territory and level of detail required that the atlas be large (13.25 x 18 in. unopened), and its high quality came at a fairly high price (currently $395 US), which meant that “the Barrington” was not always easily accessible to individuals. The application is, therefore, a welcome effort to make all the scholarship of the Barrington Atlas available to individuals anywhere at anytime. The app itself is surprisingly small, weighing in at only 411 MB. In this compact package you have access to all 102 maps of the original Barrington which are stored locally, allowing the user to browse maps on an iPad without being connected to the internet. Upon opening the app, the Princeton University Press logo appears, followed by a cropped version of the dust cover from the print version. In order to access the application features from here, it is necessary to either tap the screen or swipe from left to right. Doing so reveals the navigation menu. 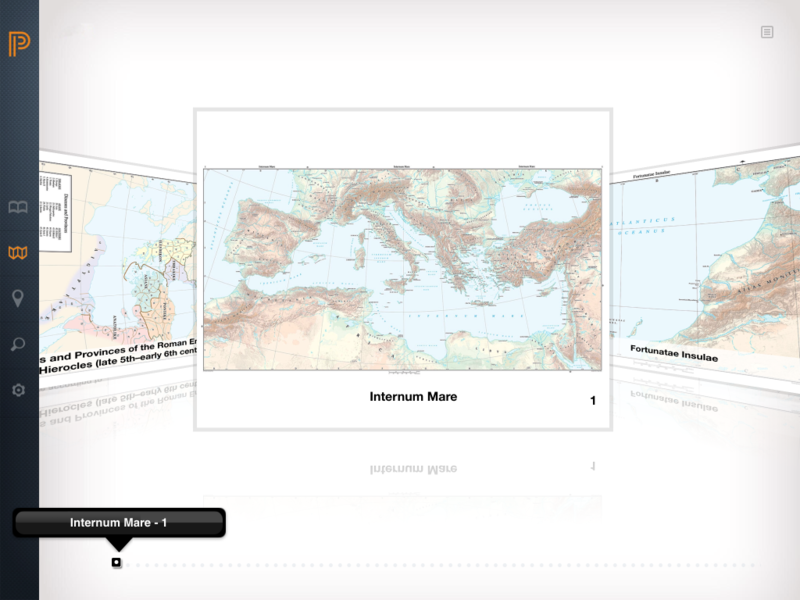 There are three different ways to view the content of the atlas. If you simply wish to browse the maps you can select the Maps tab. This will load a thumbnail gallery of all the maps in the atlas which you can flip through before tapping on a particular map to select it. Alternatively, a navigational menu button in the upper right hand corner of the gallery allows for the selection of maps by region. Simply open the menu, choose your larger region and then select a specific map. One can also use the Locator tab, which pulls up a map displaying the entire area covered by the atlas overlaid with boxes corresponding to individual maps. If you wanted to view a map of the Nile delta you could simply select box 74 to be taken to that map. If you are looking for maps of ancient sites within a modern country, a button is also provided in the upper right hand corner to turn on and off modern borders. Finally, you might be searching for a specific site in the atlas. Selecting the Gazetteer tab opens a searchable alphabetical listing of all the sites included in the atlas. 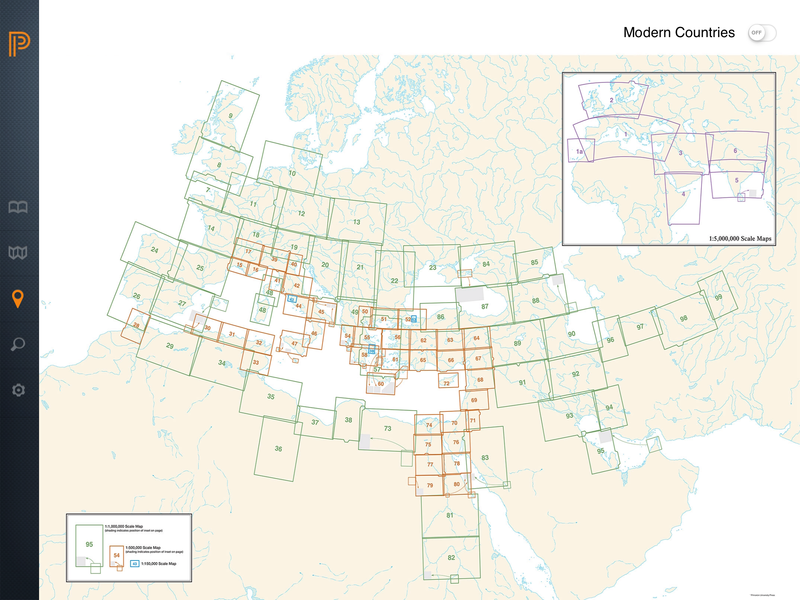 A pop-out drawer located in the upper right hand corner of the screen explains the organization of modern and ancient site names as well as country abbreviations. Searching for a site returns links to each map on which that site appears. Unfortunately, search results are not saved, so that if you click through to one map, the search must be performed again to see the other maps. It is possible, though, to save individual maps to the Favorites section by tapping the star icon to the right of the map coordinates. There are a few interesting features within the maps themselves. Tapping in the center of a map drops down a tool bar containing key and compass icons. Selecting the key icon slides out two drawers from the right which elucidate the symbols and coding of features and time periods on the map. This is a vast improvement over the print edition which required flipping back and forth within the atlas to read the key. Tapping the compass icon in the tool bar reveals thumbnail maps of adjoining regions that can be used as short cuts to those maps. Additionally, a large compass icon appears in the center of the screen; touching this icon reorients maps so that true north appears at the top of the screen. It also enlarges the map, which is less useful, forcing you to carefully zoom out again to see most of the map. It is extremely easy to accidentally zoom entirely out of a map and into the map browser; the creators might consider removing the feature allowing users to zoom out to the map gallery as it serves little purpose and can result in some frustration. Version 1.1 has already begun to address some of the issues noted by early adopters. The app no longer cycles through the start-up sequence again after backgrounding; instead it picks up on the page or map last viewed. Stability has also been greatly increased. In version 1.0 the app was given to crashing during navigation, however, I have not experienced any crashing since upgrading to version 1.1. Also, smaller symbols and place names on maps that would often appear slightly blurry in version 1.0 when fully zoomed in, are crisp and easily read in version 1.1. Still there are a few missteps, almost all of which appear to result from mimicking the print volume in digital format too closely. For example, the Introduction tab simply replicates the same material of the print edition, including table of contents and credits. While the introduction itself is worth reading, I am not certain how useful the table of contents from the print edition is within a digital app. It seems unlikely that someone searching for a map would backtrack to the introduction rather than simply use the browse or list features. Moreover, the short tutorial provided for the app is static and buried in the help section of the main menu. It would be beneficial to either pop-up the tutorial the first time the app is opened or run a short video illustrating how to navigate the app. I could wish for more interactive features within the app, such as the ability to plot routes and otherwise manipulate the maps— similar to what is found in the Ancient World Mapping Center’s on-line tool Antiquity á la Carte— but that would, I suspect, require designing entirely new maps from the ground up. I might also wish that the app was available on more platforms. As of this moment it is limited to Apple’s iOS, preventing Android tablet owners from using this wonderful resource. 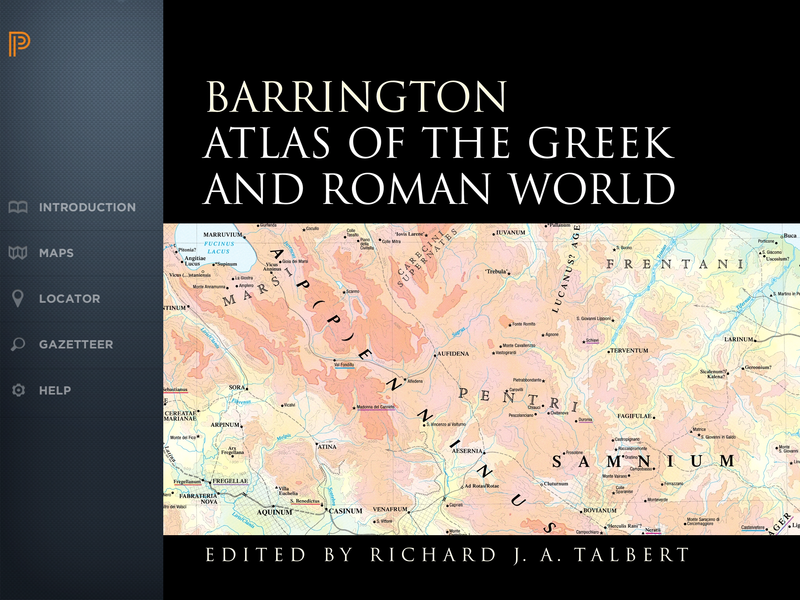 Overall, the app version of the Barrington Atlas of the Greek and Roman Worlds is an admirable effort. It provides all the information and resources of the original Barrington Atlas in an easily transportable format at a fraction of the cost. It is significantly more accessible to students and scholars at home or on the road and I suspect that, like its predecessor, it will become a standard tool for students of the ancient world. 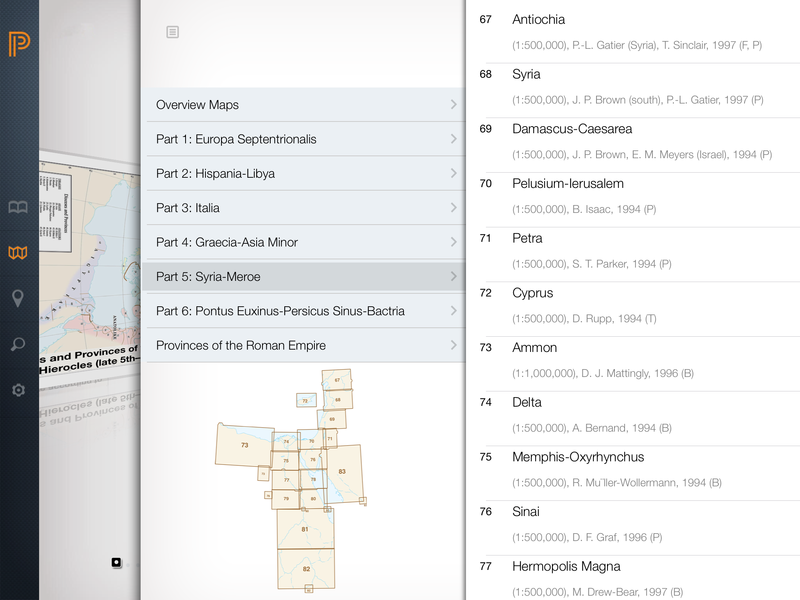 This review of the Barrington Atlas App tested version 1.1 and was conducted on a 128GB iPad Air running iOS 7.0.4. This entry was posted in DH Direct on January 15, 2014 by Chris Francese. Uncomfortable–but not paralyzed. When it comes to the new methods and media of digital liberal arts, this should be the expected feeling for both students and teachers, says Jeff McClurken. The historian and digital humanist, Professor of History at the University of Mary Washington, visited Dickinson for a wide ranging all-day workshop with faculty, librarians, and administrators on various aspects of the digital humanities on Friday, January 10, 2014. Topics ranged from the question of naming and definition (not truly significant issues, he argues), to sample projects, genres of tools, and discussions of the notion of digital literacy (he prefers the term “digital fluency”), and how to evaluate digital work for tenure and promotion. Rather than focusing on the notion of digital literacy, of making students better consumers of new media, the applications of DH in a liberal arts environment, he argued, should involve “teaching and learning through online, public, creative digital media.” When designing digital classroom projects we should encourage student creativity. The very act of producing makes students more sophisticated consumers of digital media, more “literate” in that realm, aware of its rhetoric, its genres, it pitfalls, and its possibilities. That initial discomfort with stepping outside the bounds of a traditional research paper can be a barrier, but as long as students do not feel paralyzed, they can move forward. McClurken places a significant onus on students to master tools on their own, after a brief introduction during class time. That flexibility and ability to experiment and master new tools and techniques is a key skill to be acquired in the process, he said. Group digital projects teach effective collaboration and project management, but they have to be orchestrated carefully to ensure proper credit is given to each student. He teaches a full semester digital history seminar with 16-20 students who complete significant digital projects over the course of the semester (e.g. The James Farmer Lectures, James Monroe Museum Political Cartoons). They come up with a plan, including benchmarks of progress, and a contract regarding how the work will get done, and by whom. He pointed out that the plans are almost always too ambitious at first. The students tend to offer to do a quantity of work that would be considered entirely unreasonable if it had been assigned by the professor. The platforms he prefers for this kind of work are WordPress and Omeka. One interesting example he pointed to of student initiative in this realm came from the Monroe Political Cartoons project, where the students took it upon themselves to create a video on the process of creating their scanned images–how the editing was done, what alterations were made to the source files. This kind of documentation and transparency would be helpful to many much grander digital projects, he noted. He argued that a key challenge for the digital humanities in an educational context is getting students to think self-consciously about their own digital presences. Each student at University of Mary Washington is now given his or her own domain name, and encouraged to create his or her own digital portfolio of work during their student years, an Online Resume and Digital Portfolio (e.g. http://caitlinpringlemurphy.com/). This has obvious utility on the job market, but it also has the advantage of making sure that a student’s work is clearly associated with his or her name, and of making sure they receive public credit. The program got going as a pilot for 40 faculty who were given their own domains, and was then extended to students, and will eventually be continued for alumni for a nominal fee. There are also plans at UMW to create a Digital Knowledge Center with student tutors, analogous to a traditional college writing center. These are just a few of the highlights from a very stimulating day. A large and up-to-date collection of links, along with an outline of the whole presentation, can be found here. This entry was posted in Uncategorized on January 12, 2014 by Chris Francese.